Concert of a-lure, Performance with Hermione Spriggs, 2017 Titanik Gallery Turku Finland. 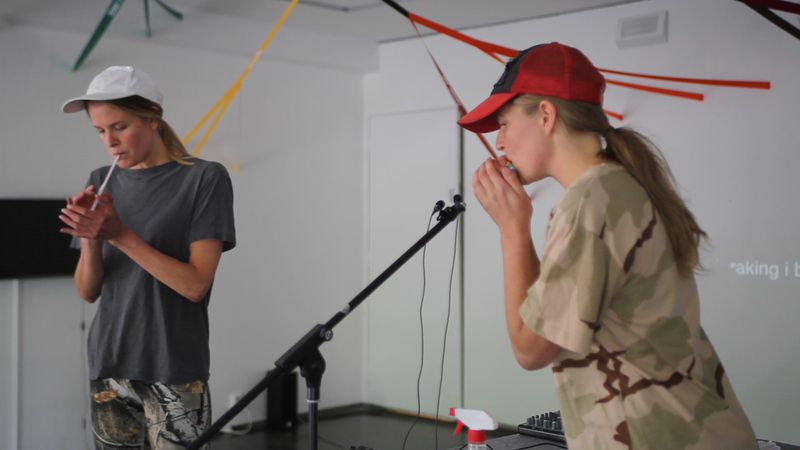 ‘Concert of a-lure’ is an object sound performance in which two androgynous performers dressed in camouflage clothing perform a series of sounds made with everyday objects. 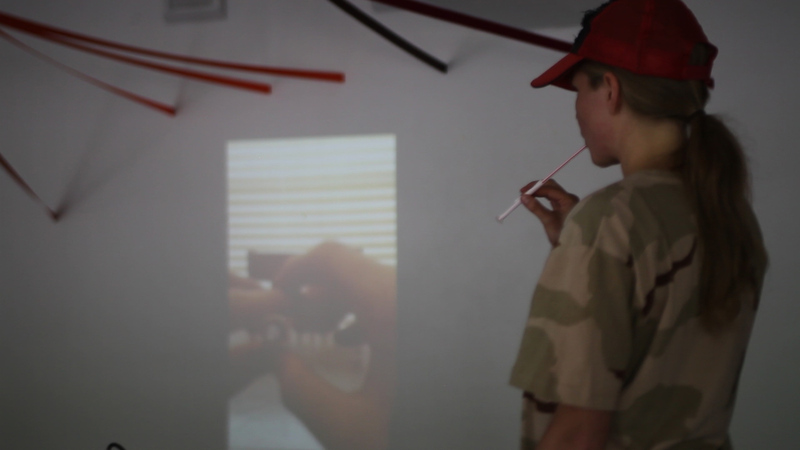 The performance draws from several Youtube instructional videos made by hunters, who show how to adapt cheap household items into makeshift instruments to imitate and therefore lure various wild animals. Images and quotes from the videos and the video comments are shown in a projection on the wall, which acts as a loose score for improvised sounds that take place. At the beginning of the performance each instrument is made and introduced by the name of the Youtuber, so for example we say ‘Meatman Gary’ and then cut up and mould a straw into a small whistle, which produces a high pitched sorrowful squeak like a distressed rabbit, or spit on a smart phone and rub a piece of polystyrene to replicate a ‘predator in distress’ call. We then begin to use the lures to full effect to communicate with each other across the performance space, and test their range and materiality. A spontaneous conversation and sound environment emerges and falls in and out of sync with the images and quotes projected in the space.